Aug. 18, 2017, 9:30 a.m.
Plus: The AP’s new fake news listing, a lack of center-right news outlets, and how to spot a fake viral video. By Laura Hazard Owen @laurahazardowen Aug. 18, 2017, 9:30 a.m. The plugin does not collect actual searches of users, but automatically conducts searches for a fixed list of 16 terms. The results are then sent back to AW’s servers. This approach creates a high degree of comparability. If two users with similar browser settings and location search for the same phrase (say “Angela Merkel”) at the same time, shouldn’t they receive identical (or at least very similar) results? Thankfully, Algorithm Watch makes public the anonymized search results that users collect to answer questions like this one. There is some stuff that would qualify as fake news (in the original non-Trumpian sense), such as an alternative ‘feminism-free’ version of Wikipedia. Approximately 1-3% of users in the sample get these ‘very different’ results when searching for the query terms. Perhaps less headline-grabbing than fake news in this regard are special interest and lifestyle media, which feature heavily in the personalized results. 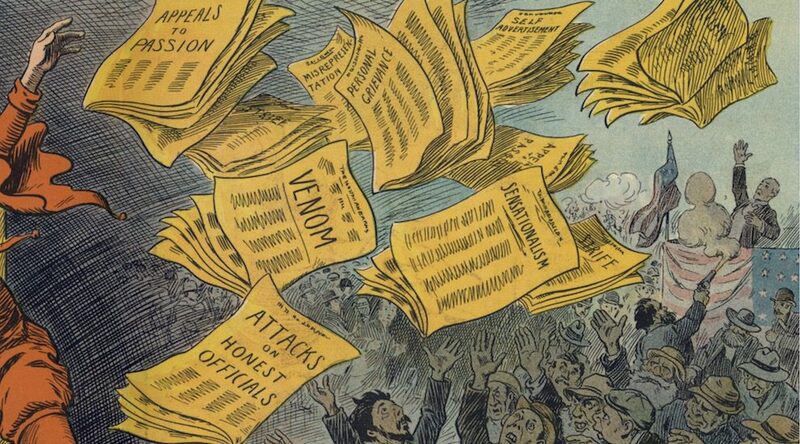 I think we need more research on the relevance of these sources for political communication. Disproportionate popularity on Facebook is a strong indicator of highly partisan and unreliable media. A distinct set of websites receive a disproportionate amount of attention from Facebook compared with Twitter and media inlinks. 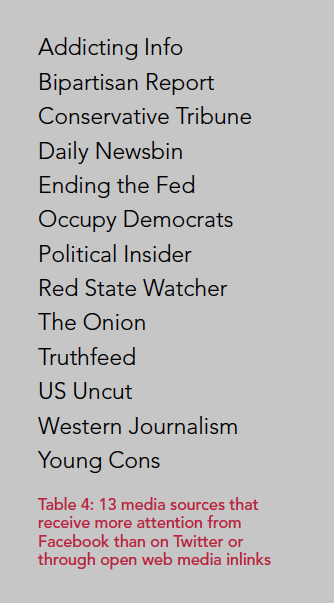 From the list of the most prominent media, 13 sites [see image, right] fall into this category. Many of these sites are cited by independent sources and media reporting as progenitors of inaccurate if not blatantly false reporting. Both in form and substance, the majority of these sites are aptly described as political clickbait. Again, this does not imply equivalency across these sites. Ending the Fed is often cited as the prototypical example of a media source that published false stories. The Onion is an outlier in this group, in that it is explicitly satirical and ironic, rather than, as is the case with the others, engaging in highly partisan and dubious reporting without explicit irony. If readers on the right shun fact-checking sites because they read their media to reinforce their in-group identity and share in partisan folklore, then new fact-checking apps will simply be ignored, and imagining that installing them will solve the rise of disinformation is merely whistling past the graveyard. Perhaps the most important antidote is in the hands of American conservatives who do not recognize themselves in the racist, populist, anti-science, anti-rule-of-law, and anti-journalism worldviews that became so prominent in the right-wing media ecosystem. Such conservatives have the legitimacy on the edges of the new right wing to speak from inside the tent, rather than throwing stones at it from outside. The marginalization of never-Trump voices within conservative circles in this election cycle suggests that such conservatives will face a steep uphill battle. We have several ways to track popular but false stories — in-house metrics tools we use, like NewsWhip, among them. We are working closely with Facebook to identify stories that are being flagged on its network as false or shared widely. Sometimes a bureau will point out an item that bubbled up on a reporter’s beat and we’ll find them that way. We search for stories that are getting traction, ones that meet our standards for fact-checking and ones we think might be more easily misconstrued, or believed. We don’t share original links for many reasons; often there are dozens of versions of the pieces moving on sites, and AP’s reporting on this phenomenon has shown many sites produce false news for financial gain. The fact-checking/debunking effort fulfills our mission to refute widely shared falsehoods. While the evidence shows there is clearly a coordinated effort to create credible-looking fake articles from English and Arabic-language news websites, the content being produced does not have consistent political messaging. The fake Guardian story was clearly pro-Kremlin, but others could be read as hostile to Russian government interests. Overall, the fake stories seem engineered to inflame international tensions. “Save democracy! With conference calls!” Melissa Ryan of the Factual Democracy Projectme is running a Kickstarter campaign to launch a conference-call speaker series about fake news, far-right, and misinformation-related topics. Some of the calls will be available to the public, others only to backers of the campaign and the press. First up: “Bots & Computational Propaganda,” on September 12 at 1 p.m. ET. Ryan also writes the newsletter Ctrl Alt Right Delete and, with Misinfocon, held a conference call about fake news during the French election earlier this year. The Kickstarter seeks to raise $21,880 by August 22; it was 80 percent of the way to that goal as of Friday morning. POSTED Aug. 18, 2017, 9:30 a.m.
Owen, Laura Hazard. "Are your Google search results another kind of filter bubble? The answer seems to be: Kind of." Nieman Journalism Lab. Nieman Foundation for Journalism at Harvard, 18 Aug. 2017. Web. 18 Apr. 2019. Owen, Laura Hazard. "Are your Google search results another kind of filter bubble? The answer seems to be: Kind of." Nieman Journalism Lab. Last modified August 18, 2017. Accessed April 18, 2019. https://www.niemanlab.org/2017/08/are-your-google-search-results-another-kind-of-filter-bubble-the-answer-seems-to-be-kind-of/.